While planning your New York vacations, keep in mind all of the wonderful places you can choose from. From a rustic country getaway to bustling city streets, New York vacation spots come in all shapes and sizes. For a great sight seeing New York vacations, you will want to check out Sag Harbor in the Hamptons. A great historic town that has been designated the First Port of Entry to the New Country by George Washington. 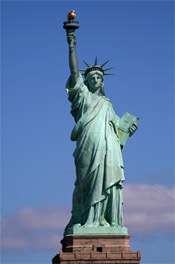 With the over whelming culture and a rich history that comes from New York City, it is a must see vacation spot. Grab yourself a map and start taking in the sights. Whether you are looking to see the fabulous architecture of St. Patrick's Cathedral, the valor of the Statue of Liberty, or ride to the top of the Empire State Building there is something here for everyone. It the home for the Winter Olympics twice, Lake Placid in the Adirondack Mountains, and has became a must see vacation spot for anyone traveling nearby. From skiing down the mountain sides to fishing in the lakes, Lake Placid is a great country retreat on New York vacations. You can take a guided tour through The Sunken Forest on New York's Fire Island. With trees over 200 years old and several ecosystems it is a fascinating place. While on Fire Island you must stop and see the amazing working lighthouse that was built in 1826. Home to the New York State museum and St. Peter's Episcopal Church, Albany, New York's capital is rich in history. They have guided vacation tours available to teach you about the coastal regions history. Travel just a touch farther north and you will be in Saratoga Springs. With world famous mineral baths and spa treatments, this New York vacations spot is for rest and relaxation.